Bobby Jacobson burst onto the golf scene in a fashion few could dream of. Only two years after winning the club championship at Hollywood Golf Club in 1932 (at age 14) he won the New Jersey State Golf Association Junior Championship and followed that up with one of the biggest upsets in the history of the U.S. Amateur Championship. When Jacobson defeated defending U.S. Open champion Johnny Goodman – the last amateur to win the Open – in the second round of the 1934 U.S. Amateur at The Country Club in Brookline, Massachusetts, the comparisons to legendary Bobby Jones began. “Latest of the prodigies to be showered with the ‘new Jones’ brand is … Bobby Jacobson. And on the form displayed by this lad to date, the label appears to have its most apt application,” read a New York World Telegram newspaper article from September 4, 1934. While Jacobson’s career never reached the heights of Jones’, Jacobson compiled a career that ranked among the best in New Jersey annals. He won two NJSGA Junior Championships (1934, ’35), one Metropolitan Golf Association Junior (1936), two NJSGA Amateur Championships (1955, ’56), and an NJSGA Pre-Senior title (1963). He won the 1952 Hochster Memorial tournament (at Quaker Ridge), was runner-up twice in the NJSGA Amateur (1950, ’51), and served as captain of the gold-medal U.S. team at the 1961 Maccabiah Games in Israel. In 1960, at age 42, Jacobson became the youngest president in NJSGA history. 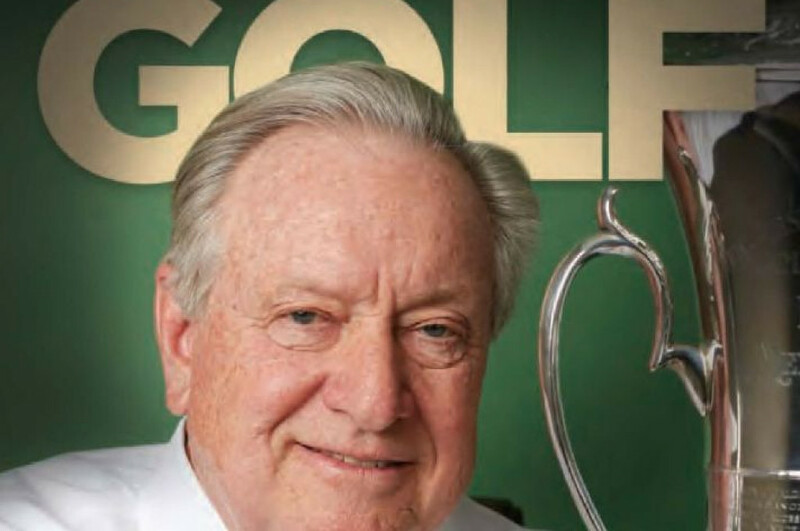 During his term, he was credited as being a co-founder of the Compher Cup, the annual competition between the NJSGA and the Golf Association of Philadelphia. He also served as president of Hollywood for four years (1963-67). As a youngster, Jacobson was fortunate that the club pro at Hollywood from 1932-35 was the legendary Craig Wood, one of the country’s top golfers at the time – and one of Jacobson’s fellow inductees in the 2019 Class of the NJSGA Hall of Fame. Along with Wood, Lou Barbaro (who was the Hollywood head professional from 1947-1976) and Jacobson’s father, Benjamin, influenced his game. Bobby and Benjamin were four-time winners of Hollywood’s Harry Content Championship, while Bobby and Barbaro also teamed to win pro-am match-play championships in New Jersey in 1951 and ’53. In July 1934, shortly after winning the NJSGA Junior at Plainfield Country Club, Jacobson was on his way to the U.S. Amateur in Brookline to face Goodman, the reigning U.S. Open champion. Goodman received a bye into the second round of the 1934 U.S. Amateur and found himself in a pitched battle with the 16-year-old Jacobson – who won the match on the 19th hole. Jacobson lasted two more rounds, eventually losing to runner-up Spec Goldman of Texas. Jacobson graduated Dartmouth in 1938 and served as captain of the golf team his senior year. According to son Bob, Jr., Jacobson loved playing soccer and suffered a knee injury during college that required surgery. It also excluded him from military service in World War II. Having already begun a career in his father’s Wall Street firm, he wanted to do his part during the war, so he helped supervise the building of airplane propellers at the Curtis-Wright plant in Fairfield. He also served as a Civil Defense officer. While at Hollywood in 1947, Jacobson had the foresight to help hire an assistant pro named Jackie Burke Jr., recommended to him by Wood. He often played with Burke, who won 16 times on the PGA Tour, including three majors. Lou Barbaro was also an influence: “Not only did Lou improve my swing – I’d always been terribly loose at the top and in the knees – but he produced a real desire for me to play and gave me the incentive to work,” Jacobson said. These influences resulted in Jacobson becoming a competitive golfer again. He was runner-up in the 1950 NJSGA Amateur to NJSGA Hall-of-Famer Billy Dear, and in 1951 to another Hall-of-Famer, Chet Sanok. He finally captured the NJSGA Amateur trophy in 1955 by defeating Jules Gatesy in the final at The Knoll Country Club and repeated a year later, besting Joe Birofka at Hollywood in 1956. “He only hit it 215-220 yards off the tee at his best, but he was a great fairway wood player. He was a fabulous chipper, putter and great sand player. He had a great 1-2 combination – he was given a great talent, and he developed it. Dad was terrific competitor, without rubbing anyone’s nose in it – and was always a gentleman,” Bob Jacobson, Jr. said. For most of his life, Jacobson was considered a living legend at Hollywood. His 25 club championships at Hollywood came in the period of 1932 - 1960, which at the time was a national club record. He only lost once in that period, and in three of the years he did not compete due to injury. In 1942, a year he did not defend at Hollywood, he won the club championship at Mountain Ridge. “Bobby was a great club member in all facets. He was old school in his manners and ethics. He was very much a gentleman,” said Ed Hirsch, who served six years as Hollywood’s president and is on the NJSGA Advisory Committee. “There was an air about him. Bobby was instrumental in my success on the golf course. He was a great player up until he suffered his stroke in 1992. In typical Bobby fashion, as soon as he was able, he showed tremendous desire to get out and play again. It was important therapy for him,” Hirsch added. During his time on Wall Street, Bobby Jacobson helped build his father’s firm from five employees to nearly 60 by the time Jacobson & Sons was sold to Goldman Sachs in 2001. “For as good a golfer as he was, he always wanted to be known as a great specialist on the New York stock exchange,” Bob Jacobson Jr. said. Known as a “dominant figure in Hollywood golf over the years,” the Bobby Jacobson Room was dedicated in 2006, just after he passed away at age 88. It was a fitting tribute to a man who not only played golf extremely well, but also gave so generously to the game.